The Holy Nicholean Catholic Church is currently taking applications for Holy Orders. Vocations to priesthood, including all minor and major orders are granted by direct invitation of Patriarch Nicholas III himself. Under general circumstances, candidates are hand selected from active members of the local congregation in the Atlanta, Georgia area or through qualified applicants who intend to serve our outreach ministries in Atlanta, Georgia. 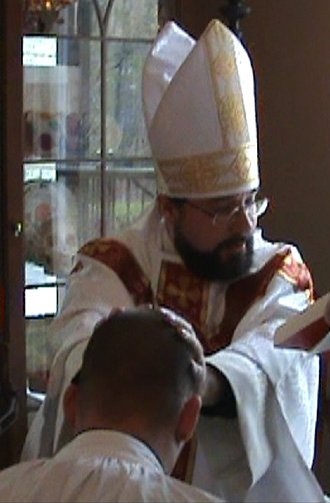 In order to secure against the frequent and relentless abuses found within the Independent Sacramental Movement, all candidates are required to complete a free private seminary/mentor-ship program lasting several years before approval for ordination to the priesthood is granted. So as to assure the protection of our Sacred tradition and the integrity of the sacramental mysteries under our care, there will be no exceptions to this policy. a) obtained or is in the process of obtaining [minimally] an accredited bachelor’s degree in any discipline (although, degrees in philosophy, religion, theology, and psychology are preferred). b) is willing to participate fully in the liturgical life of the Church under his assigned bishop. c) understands that although this may change, at this time, clergy are not paid a salary. d) is prepared to take a solemn vow of obedience [for life] to the bishop over his jurisdiction. e) is willing to fully grasp and implement the complexity of the Catholic faith. f) has some adequate understanding of mysticism. g) has a drivers license and reliable transportation. h) is willing to be trained as an exorcist due to the the Holy Nicholean Catholic Church’s primary outreach ministry being a spiritual crisis resolution ministry. i) is either married or willing to remain chaste until marriage. j) understands that acceptance into the seminary program is a discernment process and does not guarantee ordination. If you are an individual who feels strongly that God is calling you to become a Nicholean Catholic religious or priest AND you are prepared to serve the people of Atlanta, you may make a formal request to be considered for our seminary program that may lead up to priesthood by filling out the confidential online application below. This also applies to currently ordained ministers who would like to incardinate into our Church so as to serve the people of Atlanta, Georgia. Complete your immigration process on your own and pay for it yourself. Pay for your own travel expenses related to the application process. Have a detailed strategy prepared for how you are going to support yourself once you arrive in the United States due to the church staff working strictly on a volunteer basis only. The Holy Nicholean Catholic Church does not issue employment or pay salaries at this time. Have plans for where you are going to live due to the church monastic dormitory currently remaining in the planing stages until more funding is secured to establish such a building. We are regretful to report that all international applicants who cannot produce evidence of the above will not have their applications accepted. If Married, in what denomination were you married or was this a civil ceremony? If yes, list the names and ages of all children. If yes, in what denomination were you ordained? If yes, in what denomination were you baptized?